So many ships have been lost off Cape Hatteras that the area is known as the "Graveyard of the Atlantic"
The Tybee Island B-47 crash was an incident on February 5, 1958, in which the United States Air Force lost a 7,600-pound (3,400 kg) Mark 15 nuclear bomb in the waters off Tybee Island near Savannah. Following several unsuccessful searches, the bomb was presumed lost somewhere in Wassaw Sound off the shores of Tybee Island. 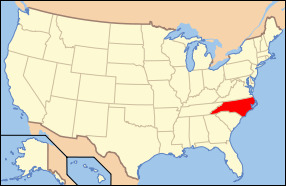 The state of North Carolina is located within the southeastern region of the U.S. And is bordered by the states of South Carolina, Georgia, Tennessee, and Virginia. The state was named as a means to honor King Charles I. It was the 12th state to be accepted into the United States on November 21st, 1789. It is the 28th ranked most extensive state in the country with a land area of 53,819 square miles and is the 10th ranked most populated state with a population of 9.66 million people as of 2011. The state consists of 100 counties and its capital city it Raleigh, however the largest city in the state is Charlotte. Over the last 50 years, the economy in North Carolina has transformed from a large reliance on tobacco, textiles, and furniture manufacturing to a much more diverse economy based upon engineering, biotechnology, and various finance sectors. The geography of the state is diverse and includes a wide variety of different elevations. The climate of the state is heavily influenced on the nearby Atlantic Ocean, and most of the state is categorized in the humid subtropical climate zone. There is also a subtropical highland climate roughly 300 miles inland from the coast in the more mountainous western region of the state. Two different U.S. Presidents were born in the state of North Carolina; James Knox Polk and Andrew Jackson. The state has many large bodies of water including the Neuse River, Yadkin River, Roanoke River, Lake Phelps, Lake Waccamaw, and Lake Mattamuskeet. The highest point of elevation in the state is Mt. Mitchel which sits at 6,684 feet above sea level. 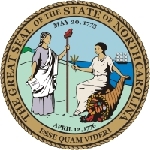 The state motto is “Esse Quam Videri” - To Be Rather Than To Seem, and the state song is “The Old North State”. The state bird in North Carolina is the Cardinal, the state fish is the Channel Bass, the state flower is the Flowering Dogwood, and the state tree is the Longleaf Pine. North Carolina has always played an important role in the overall functioning of the U.S. And even with its new and improving economy and industries, it continues to adapt to changing times in order to best serve the country. The major attractions are the Great Smoky Mountains, the Blue Ridge National Parkway, the Cape Hatteras and Cape Lookout National Seashores, the Wright Brothers National Memorial at Kitty Hawk, Guilford Courthouse and Moores Creek National Military Parks.